The production of high high-value protein (single-cell protein or SCP) via biosynthesis, using lithotrophic hydrogen-oxidizing bacteria in a reactor system. Raw materials: hydrogen (biomass energy supply), CO2, ammonium- and oxygen. In this manner, an increasingly scarce product – protein – is created from residual materials and/or energy. A key link in the water-food- nexus. The figure below details the process for a WWTP’s sludge treatment plant’s reject water. Coupling the Power-to-Protein to the wastewater cycle, in which ammonium is extracted from the reject water from the sludge treatment. How do we get the required raw materials? NH4+ Ammonium is present in abundance in our wastewater and, in today’s situation, is mostly converted to nitrogen gas via nitrification and denitrification. WWTP treatment sludge is currently digested and used for the production of biogas by the Energy Factory, the initiative of the Dutch . The sludge treatment’s reject water contains high ammonium concentrations which can be efficiently recovered by means of air stripping, for example. H2 Hydrogen can be produced via electrolysis of water, for instance using surplus electricity during off-peak hours. It can also be produced for example via steam reforming of biogas, which also results in the production of carbon dioxide (CO2). CO2 Carbon dioxide is also released in the upgrading of biogas to bio-methane. There are moreover innumerable other potential sources in urban and industrial environments. The pictures show a five-litre reactor set up at the Avecom laboratory in Ghent. The reactor can be seen as an ideally mixed reactor, into which all the raw materials, with the exception of ammonium, are fed as gasses. The reactor contains a mixed culture of hydrogen-oxidizing bacteria which, to , is stable. It is therefore not a mono-culture and sterile working conditions are not required. The images below show the microbiome under the microscope (left) and the harvested and dried protein produced by the reactor. This protein has so far been examined once for its amino acid composition. The single-cell protein is a protein-rich feed that has an amino acid profile that is comparable to that of animal protein and richer than that of plant protein. About 1-2% of the total world energy is used to produce reactive nitrogen (fertilizer) by means of the Haber-Bosch process. This process accounts for 100 Mt of the current anthropogenic sources of nitrogen, while another 35 Mt results from biological crop fixation. Yet of this 135 Mt total, only 13 Mt is consumed as vegetable protein and 10 Mt as animal protein; this represents a mere 16% net efficiency. These massive losses in the nitrogen cycle are largely due to losses during primary (plant) agriculture (runoff, leaching, volatisation and denitrification). 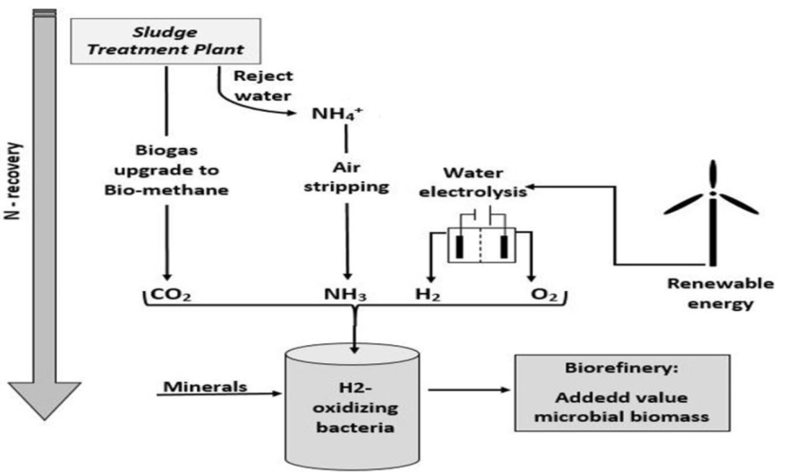 Moreover, the nitrogen that enters the waste streams is currently mainly converted to dinitrogen gas rather than reused for other purposes such as producing protein. In view of the increase in the world population, the vulnerability of the conventional crop production in the context of climate change, and the shifts of the population to mega-cities, there is a strong case for a re-examination of the current methods of destruction of reactive nitrogen in the sewage and waste treatment plants. Indeed, by up-grading he treatment plants to factories in which the incoming materials are first deconstructed to units such as ammonia, carbon dioxide and clean minerals, one can install a highly intensive and efficient microbial re-synthesis process in which the used nitrogen is harvested as microbial protein (at efficiencies close to 100%). The latter can then be used for feed and food purposes. In essence, the technology is available but a change of mindset needs to be achieved. The anthropogenic Nitrogen Cycle is extremely inefficient. The perception of wastewater as not being waste, but rather a resource for water, energy, nutrients and other components, is becoming increasingly widespread. In a circular economy the recovery and reuse of such resources is key. The Power-to-Protein concept fits in with the circular economy and is focussed on the recovery and valorisation of ammonium from the wastewater cycle. It also fits in KWR’s research programme within which, over the past few years, resource recovery has come to play an increasingly important role. Take for instance the value chains for phosphorus, nitrogen and cellulose from municipal wastewater, for lime and iron pellets from drinking water production, and for metals and salts from industrial process water; but also take the maximisation of biogas production from municipal and industrial wastewater. Into the future, renewable energy sources will gradually account for a growing share of our energy consumption. Some energy experts even foresee an ‘all-electric’ future, based on wind, solar and biomass energy. The storage of energy is becoming an important factor, and hydrogen is a prime candidate to function as an energy carrier. These developments will perhaps lead to a hydrogen economy. 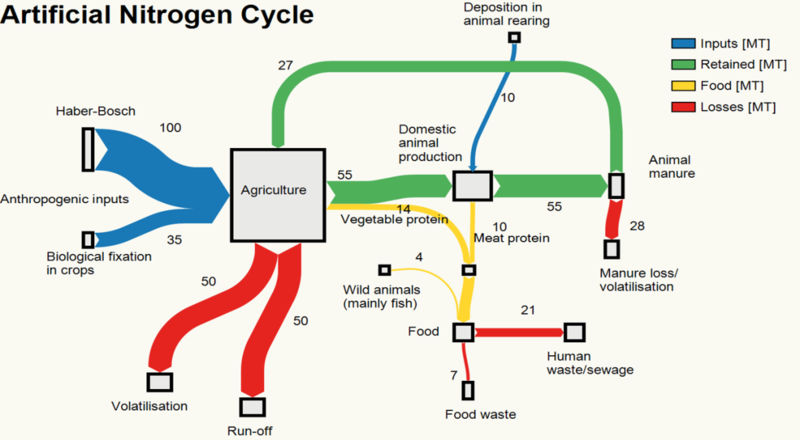 The Power-to-Protein concept in every way fits in with this future resource-recovery and hydrogen-economy scenario.